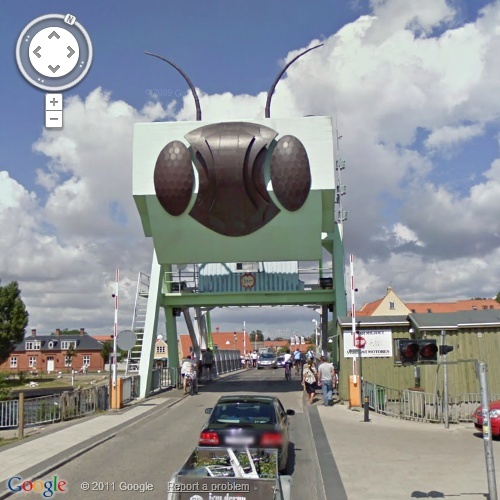 Grasshopper Bridge (Græshoppebroen) is a small bascule bridge over a canal in the town of Karrebæksminde, Zealand, Denmark and connects Karrebæksminde to the town of Enø. The bridge has a strange look like a grasshopper. The original bridge was built in 1936 and on its fiftieth anniversary in 1986 it was painted green. Because of its green colour and side profile which had resemblance to a grasshopper, it got its nick name of grasshopper bridge. The grasshopper look was further accentuated when after major repairs in 2005, its front was decorated with grasshopper's facial features including antennae. One of the main highlight of the bridge is newly laid deck made of fibreglass, first such use in Denmark. The new deck is supposed to last for several decades as compared to old wooden deck which was made of wood and had to be replaced every 5 years or so. 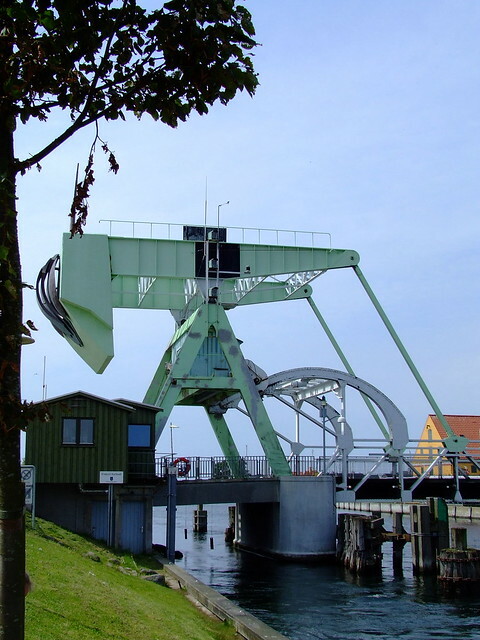 Being light weight, fibreglass is reportedly being increasingly used now for bascule type bridges.